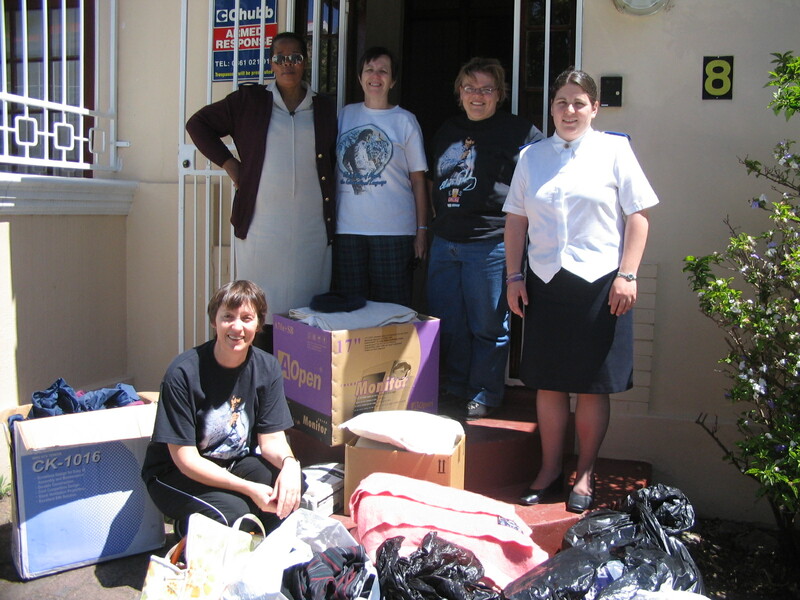 In 2007 four EPFCA members flew to Memphis to commemorate the 30th Anniversary of Elvis' passing. Our dream had come true. 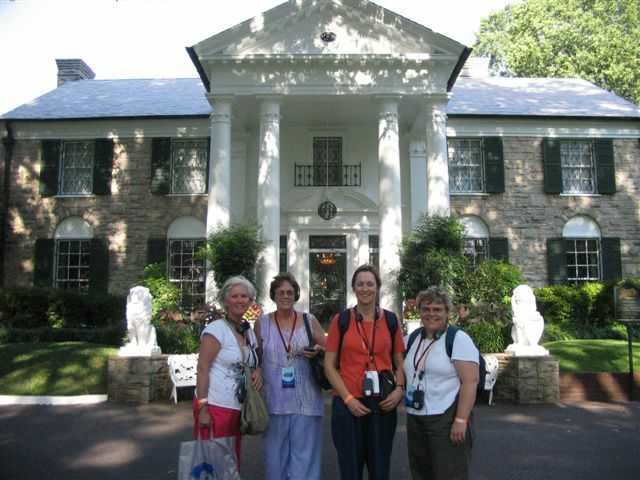 We arrived midday 5th August, booked into our Red Roof Inn Motel and drove straight to Graceland. Nicolette was our designated driver and Annemarie our navigator. Those first moments gazing over the wall at the mansion cannot be described. Our feelings were overpowering. 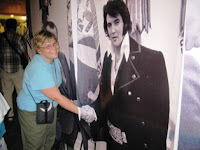 We were on Elvis territory and wanted to see and experience everything Elvis possible. As this was the week before actual Elvis Week, we had time to explore all the well-known places Elvis knew... Humes High, 2414 Lamar Ave,Lauderdale Courts, Sun Studio, Audubon Drive 1034, 1266 Dolan Drive, the Circle G Ranch, Mid-South Coliseum, Liberty Land with the wooden Zippen Pippin, Stax Museum - the list goes on and on. One of my highlights, the Overton Park Shell, was still beautiful though neglected. All of us were imagining Elvis performing here. Then, at last, our Graceland VIP tour - what an emotional drive up to Graceland, through the music gates and up to the house. Heart overflowing, tears streaming down my face - I was here. Walking through the house for the first time, I felt like a zombie. Standing at Elvis' grave 30 years on, I felt so privileged sharing what so many people still felt: love and respect for Elvis and his legacy. Back through Graceland, drinking in every little detail this time. Hall of Gold, Racquetball Court - could one person really have achieved all this? YES! ELVIS! Then came the Automobile Museum, the aeroplanes and other exhibitions across from Graceland at the Plaza. All of us were sometimes just speechless, trying to absorb all we were seeing. Visiting the mansion yet again, we were the last four alone inside before they closed. What a feeling - just us and Elvis! We also revisited the grave again and again, each with our own thoughts and longing. 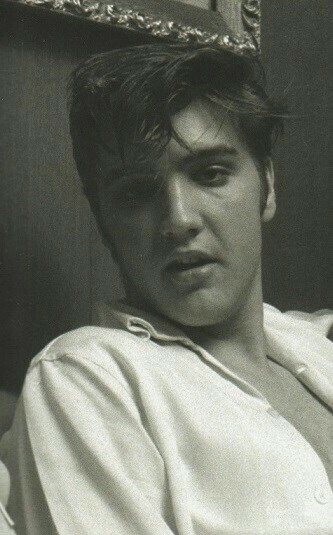 Tupelo! Wow, touring the wide open American highways. I haven't mentioned the heat, yet, but here in Tupelo it was really, really hot. The little shotgun house, Tupelo Hardware Store, Lawhon Elementary and much more. A real satisfying day. We met up with fellow club member John Webb at the Plaza. Everyone bought FTD CDs and books. The official opening of Elvis Week was held at AutoZone Park with a baseball game between the Memphis Redbirds and Omaha Royals, ending with a fireworks display to the beat of Elvis music. Magnificent. Beale Street, The Peabody Hotel, a trip down the Mississippi River on an authentic paddle boat, Elvis Expo, Insiders Conference - just a few activities we attended. I even got to shake Jerry Shilling's hand and chat to him while he autographed his new book for me. A great Elvis-related moment. A first ever - two movie nights on the lawn at Graceland. Elvis on the big screen in Viva Las Vegas and That's The Way It Is. Loved it. Then the 4th Annual Movie Festival at Malco Theatre's Studio On The Square with more movies on the big screen like Girl Happy, Charro and Speedway. Just couldn't get enough. At last, the Candlelight Vigil, 15th August. First a moving ceremony, If I Can Dream being the theme, then the queues waiting to pass the grave. We stood in the queue from 12.30 a.m. It was still very, very hot. Huge standing fans all over cooled us down. Candles were issued at the music gates and lit with a flame from the everlasting flame at Elvis' grave. We walked two by two, there being so many fans and stood at the grave at about 6 a.m. That night 75,000 fans passed by Elvis' grave - all sad and happy to be there. Totally exhausted we drove home as the sun came up, but so grateful to have been there for the commemoration event. Then came Elvis - The Concert and directly after that the Midnight Vegas Show. Absolutely brilliant. Totally overwhelming - imagine, just imagine that Elvis is performing live to a sold out auditorium. I was quite shell-shocked for a while. The whole set-up was amazing, it so easily could have been live shows. This mind-boggling Elvis Week ended with the Night of A Thousand Stars - a meetup with some film co-stars of Elvis through the years - Suzanna Leigh, Ed Faulkner and Jan Shepard to name a few. Lastly, it was back to Graceland to say goodbye, sign on the wall and remember: he dared to rock That's All Right - 5 July 1954! As George Klein says: "The sun never sets on a legend". We'll be back! If you're not an Elvis fan - you just don't get it!